• Sensitive and accurate. Use as little as 5 μL sample. Linear detection range 0.1 mg/dL (41 μM) to 3 mg/dL (1.2 mM) Mg2+ in 96-well plate assay. • Simple and high-throughput. The procedure involves addition of two reagents and measuring OD500nm. Can be readily automated as a high-throughput assay for thousands of samples per day. • Low interference in biological samples. Assays can be directly performed in serum and urine samples. Magnesium (Mg) is one of the most abundant and essential minerals in mammals. Magnesium is involved in more than 300 biochemical reactions in the body and plays important roles in muscle and nerve functions, heart rhythm, immune system and bone formation. Magnesium deficiency may lead to nausea, fatigue, muscle contractions, hypocalcemia and hypokalemia. 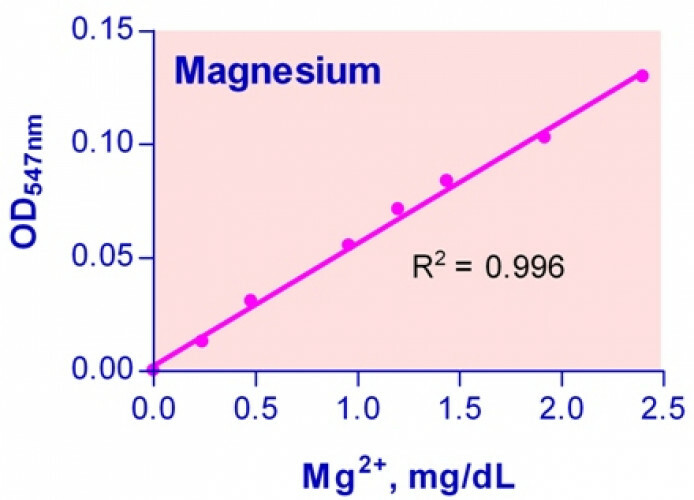 Simple, direct and automation-ready procedures for measuring magnesium concentration in biological samples are becoming popular in Research and Drug Discovery. BioAssay Systems’ magnesium assay kit is designed to measure magnesium directly in biological samples without any pretreatment. A calmagite dye in the kit forms a colored complex specifically with magnesium. The intensity of the color, measured at 500 nm, is directly proportional to the magnesium concentration in the sample. The optimized formulation minimizes interference by potential substances. Applications For quantitative determination of Mg2+ and evaluation of drug effects on magnesium metabolism. References Assay: Magnesium in Human cerbrospinal fluid (Pubmed). 2. Elizondo MR et al (2010). trpm7 regulation of in vivo cation homeostasis and kidney function involves stanniocalcin 1 and fgf23. Endocrinology 151(12):5700-9. Assay: Magnesium in Zebrafish blood (Pubmed). 3. Kim TW et al (2006) Rapid production of milligram quantities of proteins in a batch cell-free protein synthesis system. J Biotechnol 124(2):373-80. Assay: Magnesium in cell free system protein (Pubmed). 4. Pachikian BD et al (2010). Changes in intestinal bifidobacteria levels are associated with the inflammatory response in magnesium-deficient mice. J Nutr. 140(3):509-14. 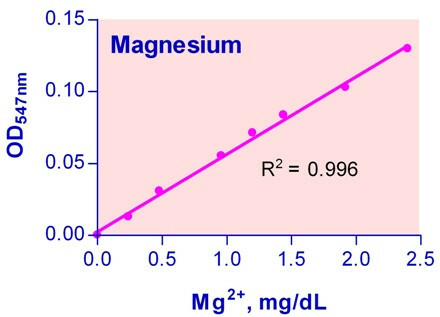 Assay: Magnesium in Mouse serum (Pubmed). 1. Stippler, M et al (2007) Serum and Cerebrospinal Fluid Magnesium in Severe Traumatic Brain Injury Outcome. J Neurotrauma. 24(8): 1347-1354. Assay: Magnesium in Human cerbrospinal fluid (Pubmed).